The European Space Agency’s fourth Automated Transfer Vehicle (ATV-4) undocked from the International Space Station’s Zvezda service module on Monday, Oct. 28, 2013. Europe's huge robotic resupply vehicle, dubbed Albert Einstein, was cast off the International Space Station on Monday after completing its delivery mission to the orbiting lab. The Albert Einstein space cargo ship was the fourth of five Automated Transfer Vehicles, or ATVs, developed by the Europe Space Agency (ESA). 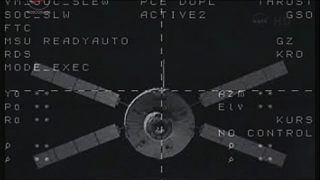 The spacecraft undocked at 4:55am EDT (0855 GMT) as the space station was orbiting about 260 miles above Kazakhstan, video from the ATV-4's departure shows. In a goofy photo, the six astronauts on board the International Space Station pay tribute to the departure of their resupply ship named after Albert Einstein. When ATV-4 launched from Europe's spaceport in French Guiana on June 5, it was heaviest payload ever carried by an Ariane rocket. Named after the the famed theoretical physicist, it delivered a record amount of cargo to the space station, ferrying more than 7 tons (6.3 metric tons) of food, supplies, fuel and experiments. ATV-4 will orbit Earth for a few days and then on Saturday, it will fire its engines to descend the Earth's atmosphere and burn up over an uninhabited area of the southern Pacific Ocean. The space freighter's departure makes room for the arrival of a manned Soyuz capsule on Nov. 7 carrying three new crewmembers: NASA astronaut Rick Mastracchio, Japan Aerospace Exploration Agency astronaut Koichi Wakata and Russian cosmonaut Mikhail Tyurin. For a few days, nine astronauts will live and work aboard the orbiting lab. On Nov. 10, Italian astronaut Luca Parmitano, NASA astronaut Karen Nyberg, and cosmonaut Fyodor Yurchikhin will return to Earth aboard their Soyuz. To honor Albert Einstein's departure, all six astronauts currently on board the space station posed for an Albert Einstein-esque group photo, sticking out their tongues in a tribute to one of the most famous pictures of the scientist ever taken. Parmitano posted the image on Twitter and his Facebook page. The first ATV, named after adventure novelist Jules Verne, flew to the space station in 2008. The next and final ATV is named for Belgian priest and cosmologist Georges Lemaître and it is scheduled to launch in mid-2014 for a six-month mission at the station.